See the new presentation here! 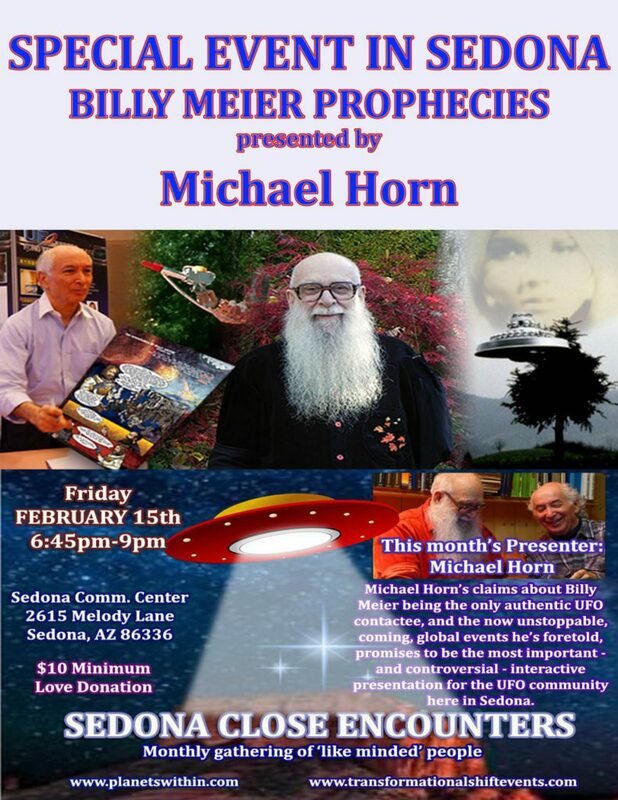 This event is intended to inform people about the now unstoppable, coming, global upheaval, as foretold – often through time travel – by the Plejaren extraterrestrials and Billy Meier, as well as to break through the relentless barrage of disinformation directed at people interested in the topic of UFOs and extraterrestrials. It’s time that the real truth was plainly spoken and available for those who are ready for it. Unfortunately, UFOlogy itself has the least scientific, lowest standards of almost any field of interest, which allows the most nonsensical, patently false and outrageous claims, by completely unqualified and non-credible people, to be presented without evidence and/or substantiation. Most of the disinformation-filled claims, willingly promulgated through the so-called UFO community, are generated by secret military (most UFOs are secret military craft) and intelligence groups. Their real, sole purpose is to prevent widespread awareness and examination of the singularly authentic Billy Meier UFO contacts, now spanning over 77 years in Switzerland. In fact, the Meier contacts are the real reason for, and object of, the so-called UFO cover-up. Strangely enough, it is Meier’s singular authenticity that absolutely infuriates many so-called UFO enthusiasts, dabblers who trivialize the entire subject, childishly believing there “must” be any number of other actual “contactees” because they simply can’t fathom the staggering implications and significance of the actual, historically unprecedented reality. For his trouble, Meier has been not only vilified and defamed but also the target of almost two dozen assassination attempts. While none of the many liars and charlatans peddling UFO nonsense are even mildly inconvenienced. The self-seeking UFO profiteers, and those who pretend to be “contactees” with extraterrestrials, with their utter disregard for the truth, have harmed those they’ve misled, ensnaring them in their deceitful webs. And through their willful and knowing contempt for, and defilement of, the truth, they also bring upon themselves their own self-created consequences. Certainly, the undiscerning, gullible, escapist, fantasy and entertainment seeking masses also willingly abdicate their own self-responsibility and critical thinking, thereby retarding their own evolution in the process. The times demand that people get back into reality, to stop naively accepting outrageous claims as truth. Therefore, this event will…not be a forum to entertain people’s subjective claims about UFO sightings, or so-called “alien abductions”, “alien-hybrid babies” and other delusions for which no actual, scientific evidence exists. Now is the time that we must see things as they actually are, cease lying to ourselves and others, and prepare to deal with realities that will demand the utmost sobriety in order for us to successfully survive them. It will further require that we develop and/or strengthen healthy, mutually beneficial cooperative relationships. All open-minded, rational, critical thinkers are welcome to pose any questions and challenges pertaining to the information and evidence presented. This event will be videotaped for subsequent widespread distribution. The continuing fulfillment of the no longer avoidable events will also result in the inevitable demise of the cynical UFOlogy fraud, with its disinformation organizations like MUFON, TTSA, OpenMinds, etc., and equally complicit, pseudo-scientific groups like SETI. There will be time for Q&A as well. You will definitely want to attend this very important presentation! Is this a free event! $10, a portion of the proceeds go to the benevolent Michael Horn Wildlife Fund, which of course helps promote my wild life. Hope the show goes well and you pack them in, Michael. Your presentations are worth every cent!! I hope many new people are introduced to the Meier case through this blog and upcoming presentation. Here is a good summary of what scientists and experts said about the many different kinds of physical evidence provided by Billy Meier…. And I also hope that they will then participate here also. Hey Michael, long time no speak! Will this be online to view ?? Yes, sometime after the event the producer will post it and I’ll provide a link to it. Has Billy ever mentioned about Cannabis oil curing or killing cancer cells ?? Love the poster! Great colors! I agree. Joe, the promoter of the event, did it. Stuff like the UFO circuit at its most basic level is a con game and generally a long one at that. This is because Earth humanity hasn’t bothered itself to be conscious of cons in general that they encounter in the day to day interaction with folks as well as in their own thoughts. Conning oneself is just as bad as being subject to a swindle or con. That being said, these long cons generally don’t directly rely on tangible things (like evidence) but the feelings of want with regards to tangible things using sophistry, word games, and other stuff to pull the listener, reader, or viewer into a certain walled off mindset or mind box or fantasy. So it’s no wonder the scenario we have from Billy and the P’s is that Earth Humanity would busy itself conning someone else to gain things rather than doing the hard work needed to actual work with each other for the amount of problems facing Earth Humanity as a whole. I tried to email this Hawaiian latte sipper Kaupalelele a few times, but he never posted any of the credible information I sent. But he will share Cobra, David W, and Corey Goode till the cows with organs removed by aliens come home. The guy Kauilapelelelelele gets about 15,000 to 20,000 hits per day. Meanwhile I’m over here grinding it out one person at a time. There is no shortage of disinform and distract con artists. Political con is probably far worse as we now have Presidential candidates throwing the umbrella of “national security” to any/all social reforms/issues that doesn’t sound like it will turn out for the better come 2020. This is the danger with using executive powers to circumvent the congress when people with far worse ideas will use it as a tool for social reorganization. Do you know if Billy or the P’s commented about the upcoming contentious political discourse rearing its ugly head at the moment and whether it can be averted? The “left” is looking more like the Popular Front from the 30s where Spain went head long into a civil war as political compromise was largely thrown out the window resulting in a non-functional government (anarchy or chaos from the HP IIRC). Hi Greg, it’s got to be hard to complete in a such a climate of BS. It’s too bad the rest of the world doesn’t follow NY Attorney Generals lead in making the use of “bots” illegal. Recent report that 51% of Facebook users, 48% Twitter accounts are FAKE, plus the 3.5 million “bots”. Half of Twitter is fake, and I get shut down for posting Asket and Semjase memes. With zero explanation or response to my appeals. I have videos of the metrics (number of views and engagements) of some of my tweets being cut down right before my eyes. Then I move to gab.ai. And then Gab gets shut down! Get on board with vk.com! It is just like Facebook with out censorship and constant ads. It is Russian service but a lot of English speaking are joining in because it is just better in every way. You can also find all the dissidents there who have been kicked out of faceberg. I especially like their timeline feature because it is not censored or filled with ads. It made me want to actually post that I have been thinking about whether you should do this at the beginning of your lectures so as to give the audience a taste of what the UFOs and extraterrestrials are really ALL ABOUT !??!!? OK! I guess I should now state why I think that you should give the audience a taste of the purpose of life at the beginning of your lectures and not only at the end (you could do both). I have seen some of your videos, if not all that are publicly available (I’ve bought them all, nearly) and have noticed some leaving before the end, probably because they are wiser than you! To all my fellow Finnish countrymen reading this blog, if you are interested in connecting with a like-minded individual(s), then I would like to ask you to contact me through this site or the FIGU forum where I have also posted an announcement with my contact information. I have some ideas for the formation of a possible study group and would like to discuss them with anyone interested. If you have also recognized your duty, then please do not hesitate in contacting me. All the best to you. I am willing to study. I dare you to murder 8.5B fellow human beings, no really, I dare you; and then stand there in the dark of night with absolutely no light but the starlight and say to yourself that you are better than those that you murdered. Next PostNext The Adventures of Billy Meier…Back Online!